The chess game (Cờ tướng) is widely played in Vietnam. It is not only played in the private lounges of leading figures, but very often in the streets, right on the sidewalks. It’s a very popular pastime for many car or cyclo drivers and hawkers during their free time. 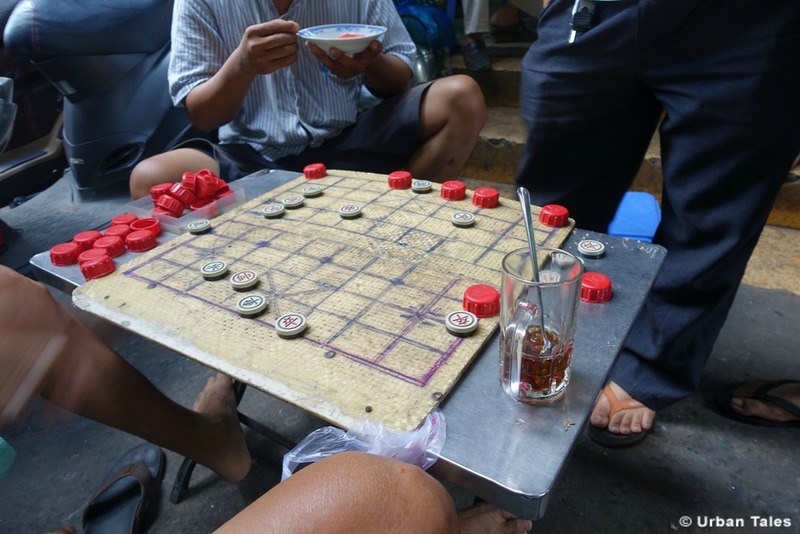 Cờ tướng (literally meaning “game of the General”) comes from the Chinese Chess “Xiangqi” (“The Elephant game”) which is one of the most widely played board games in the world. According to History, games from the chess family such as the Cờ tướng originated in India and then spread to the rest of the world. It appeared in China within the first century BC with the establishment of the Han dynasty. It requires two players, each in possession of 16 round pieces with their name engraved in ideograms. This strategy board game is played on a board nine lines wide and ten lines long, with the pieces being played on the intersections lines, rather than on the squares of the board. A Western player seeing for the first time the Vietnamese chess is generally surprised because he does not see the usual figures of Western chess: knights, castles, bishop, etc and he sometimes mistakes it for draughts. Besides, the board has a white band in the middle and the squares are all the same color (white), which is also surprising for Western players. The Cờ tướng has significantly different pieces and movements. For example, there is no Queen but there are Cannons. The other pieces are the Generals (or Governors), the Advisors (or Guards), the Elephants (or Ministers), the Horses, the Chariots and the Soldiers. The pieces are usually made of wood, plastic or ivory or even round pieces of cardboard. The starting positions of the pieces are arranged as shown on the board. Each player alternates, moving one piece in each turn. All pieces capture by using their normal moves and landing on a point occupied by an enemy piece. Victory is achieved when one player puts the other’s general in checkmate, checkmate being when the other player’s general is under attack and has no means of escape. Cờ tướng has always been part of Vietnamese folk games but has been reviving since the 1990’s. 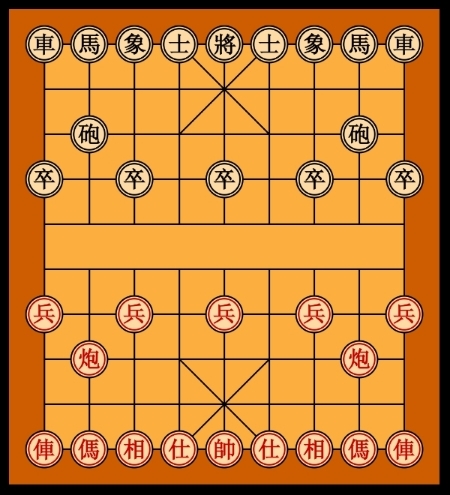 It is said that board games such as Cờ tướng appeared in Vietnam only after the 11th century AD. However, no precise records can be found. At the beginning of the 20th century, it developed in Saigon, especially in Cholon, as well as in the 30s and 40’s in Hanoi with some tournaments. Then with the wars, it was put aside and made its come back a decade after national reunification. It is said that Uncle Ho himself was known to be a big fan of Cờ tướng which he even dedicated one of his poems too. In Hanoi, players usually gather around Hoan Kiem Lake and at Ngo Tram and Doi Cung streets. 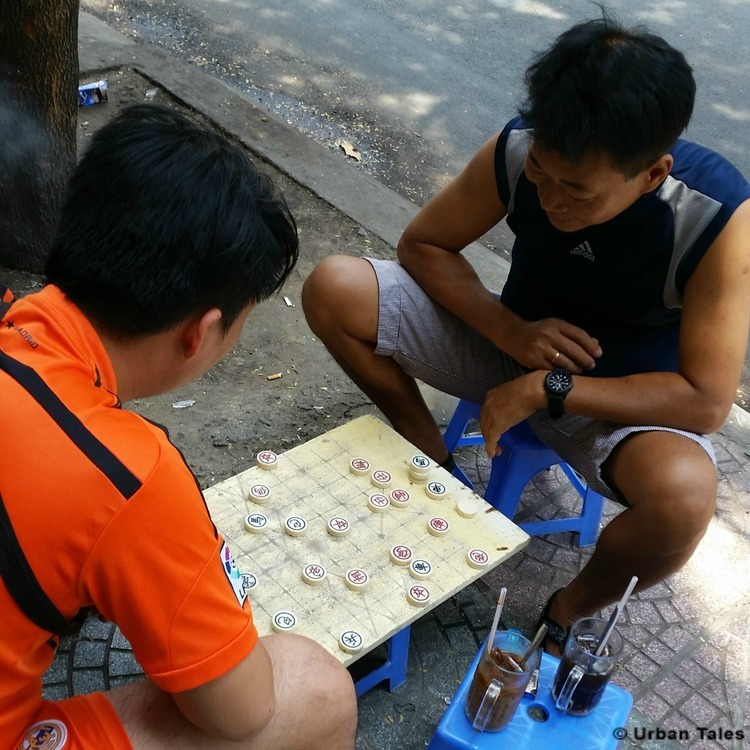 In Saigon, players can be found in alleyways like Su Van Hanh (Q1), in some clubs for the elderly and in many streets in Cholon. Cờ tướng attracts people of all ages, even women and nowadays, young people even like to play it online on some platforms or apps. If you want to see people playing at it in the heart of Cholon, book our self-guided tour and come investigate the strange case of Dr. Lam!